I did something bad during my 6-day trip in Manila. 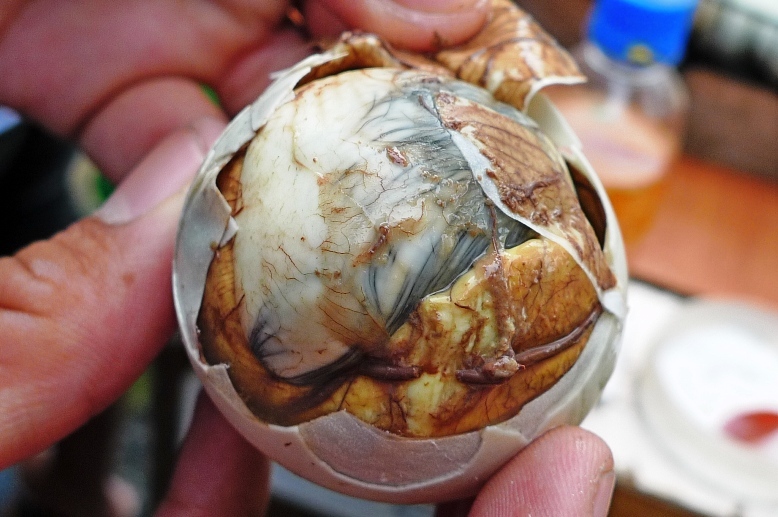 Don't know what balut is? It is a boiled fertilized duck or chicken egg with a nearly developed embryo that is eaten in the shell. Puking already? Haha! Can't blame you there. 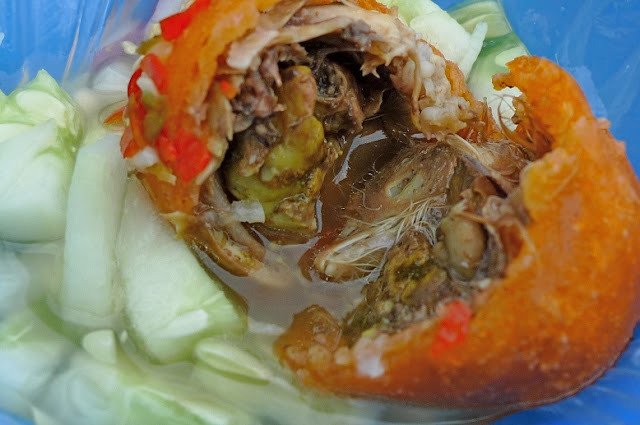 In fact, when I first heard about this Filipino delicacy, I was not sure I wanted to try it. But I knew I had to. It was as if I could not proudly claim that I have been to Manila without eating balut! And so when Ishmael Ahab, my good blogger friend whom I met up in Manila, wanted to bring me to savour this famous street food, I was all for it! Right after our buffet at Kamayan, we walked over to Rizal Park, which I shall blog about in the next post. The walking at Rizal Park was good as it helped my digestion so that my stomach was not too full and was ready to take in the balut! 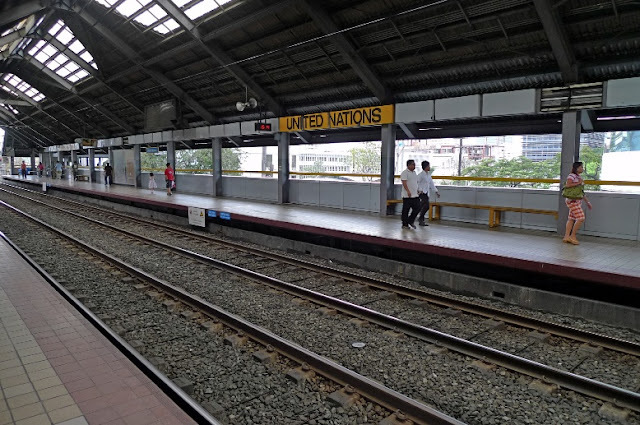 Ishmael led me to the United Nations LRT station where we would be taking the LRT to Quiapo. 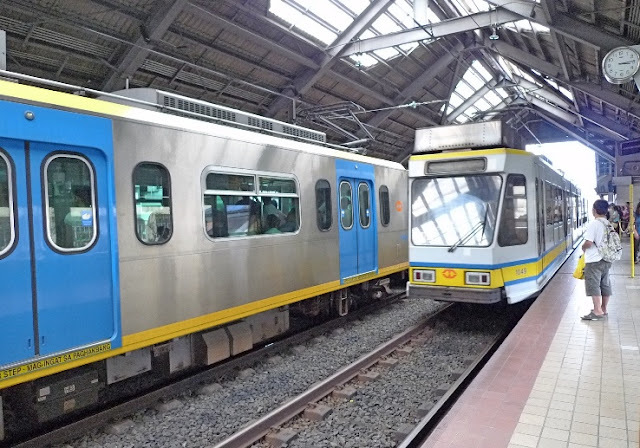 I was wondering why the LRT tracks look like a traditional railway track with stones and all. Noticed the time? 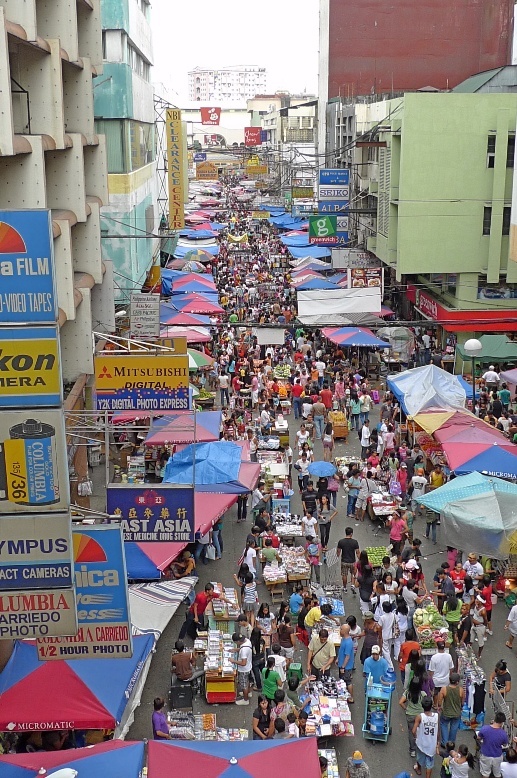 It was 3.15pm on a Sunday afternoon in Manila. I had chosen this day to meet up with Ishmael as he was more free on Sundays. Quiapo was very near from Rizal Park - just two stations away. 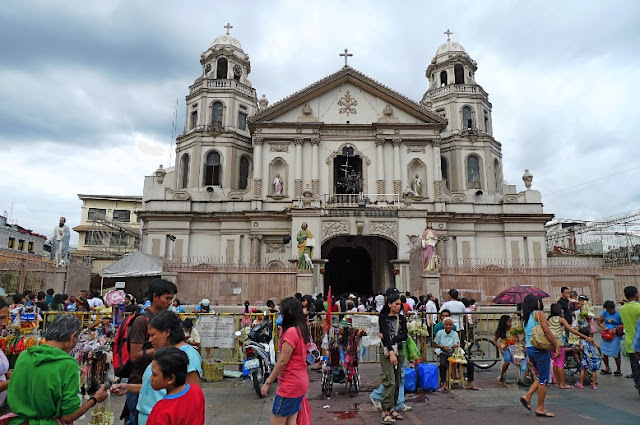 In fact, Quiapo is just next to Binondo, Manila's Chinatown where I visited during my second day in the city. 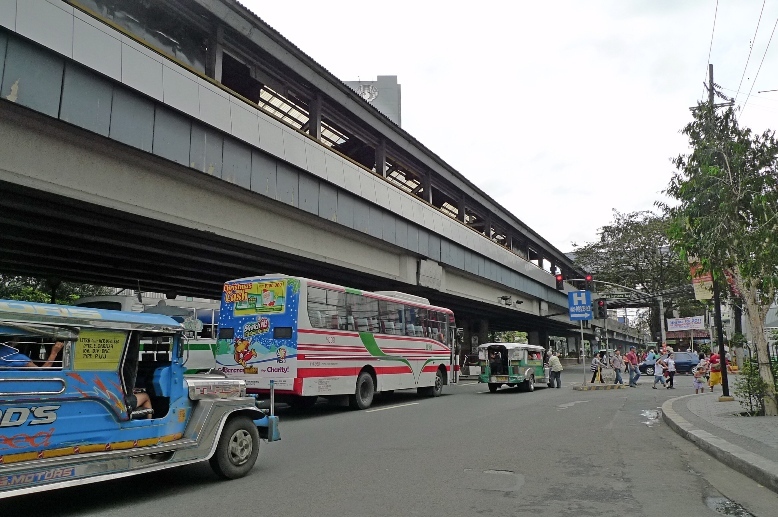 Read my Binondo post HERE if you haven't already. We got down at the Carriedo LRT Station. Oh my goodness! Look at the crowd below! 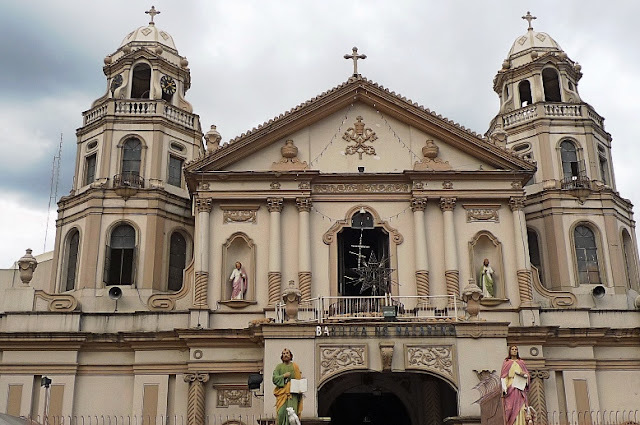 Ishamael led me to Plaza Miranda, which was in front of Quiapo Church. I think the church was having a Sunday evening mass, so there were lots of people around! I don't like crowds but if I have to go through this massive sea of people to get to my balut, then that is what I have to do! LOL! 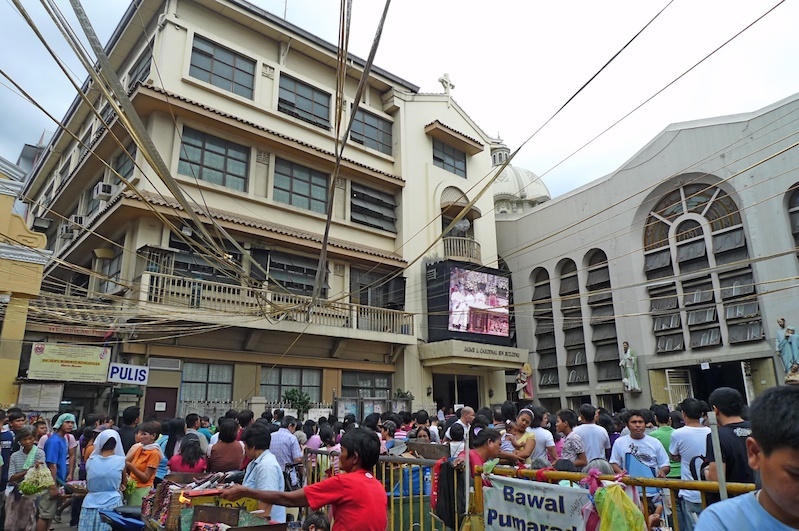 If there weren't so many people, I might have visited this Quiapo Church. One of the most popular churches in the Philippines, it is home to the Black Nazarene - a life-sized, dark-coloured, wooden sculpture of Jesus Christ. Soon, we came upon a stall selling what looked like orange balls in skewers! These orange balls are actually boiled chicken or duck eggs that are dipped and coated with orange-coloured flour batter and then fried. They are called kwek kwek. Guess what? Kwek kwek is pronounced almost like "Quack Quack" which of course reminds me of ducks. LOL! 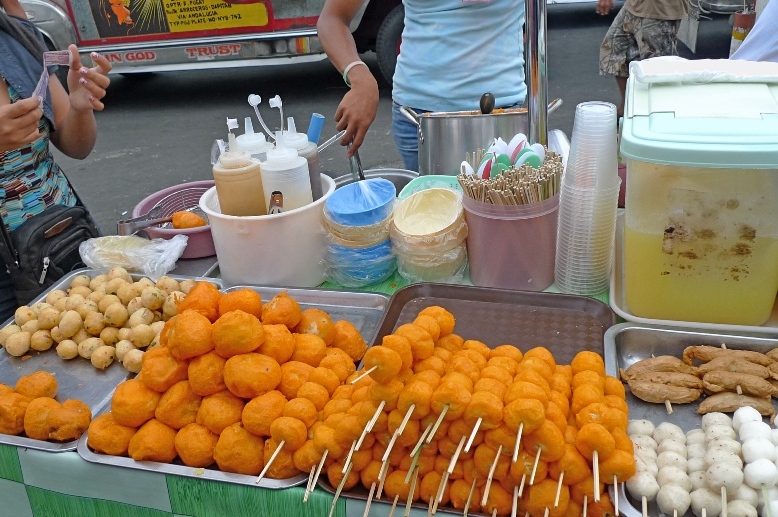 There were two kinds of kwek kwek sold at this stall. I tried the balut kwek kwek first. It is simply a balut that is fried. Gosh! Can you see that duck head and its beak? Here, let me magnify the picture for you. How was I able to eat this?! I did not think too much. I just gobbled it up, beak and all! I can still remember the crispiness of the beak when I bit into it! And guess what? It was not bad! Really. Served with chilli, onions, cucumbers and vinegar sauce, I thought it was pretty palatable. Look, if I can eat a duck, I don't see why I should freaked out eating an almost developed embryo of a duck! Was I really doing something bad? Besides, this is such a common street food in the Philippines and I heard some restaurants in Manila even serve kwek kwek as appetizers! Next, I tried the penoy kwek kwek. I guess most of you would be able to eat this without puking. Haha! 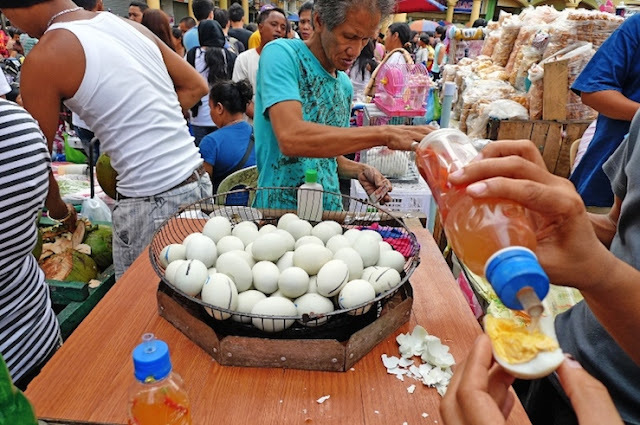 Penoy kwek kwek is the same as balut kwek kwek except that it is a duck or chicken egg that is developed after 9 - 12 days, without the formation of embryo yet. 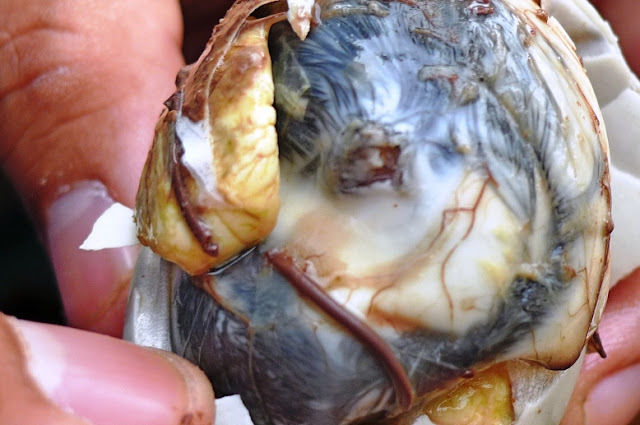 But if you are really adventurous, you must try the steamed or boiled balut, without the frying and which you eat straight out of the shell! Ishmael led me to another stall nearby selling the steamed balut. You are supposed to peel the shell open like you do an ordinary boiled egg, add in the vinegar sauce, salt and chilli. OK, I have to admit it felt a bit yucky to me at first sight. I could see the almost fully formed embryo with the veins and all. 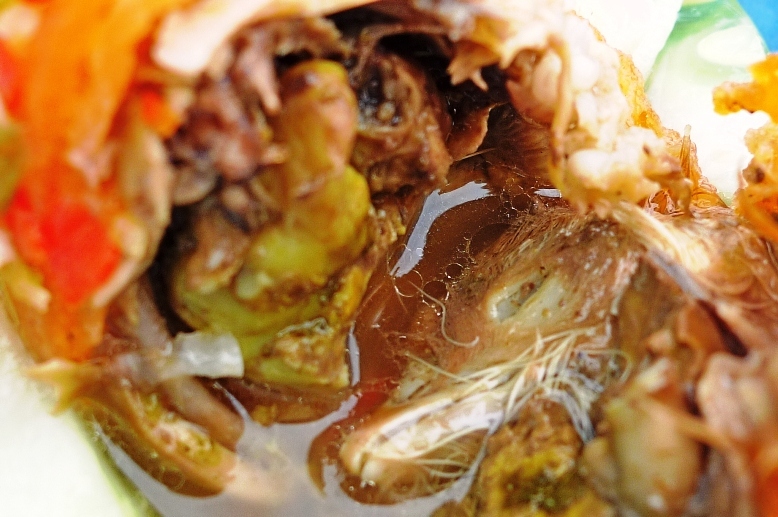 I think I was supposed to sip the broth around the embryo before I peeled the shell open, but I did not do so. I just peeled it, add in the vinegar, did not even bother about the chili and salt, and just ate it. Not that bad really. In fact, I thought this balut was fresher and juicier than the kwek kwek! Probably healthier as well since it was not fried in oil! Haha! 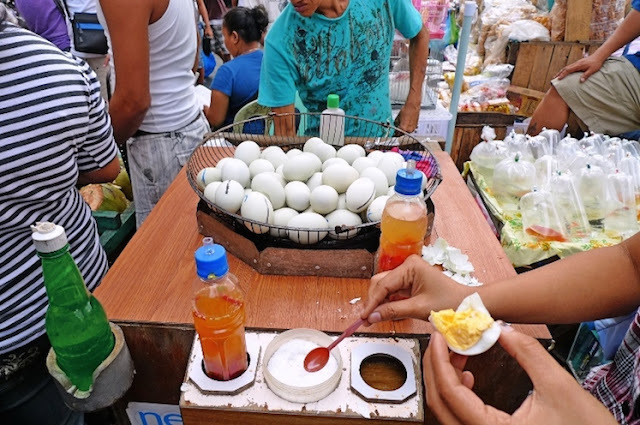 Well, would I eat the balut and kwek kwek again if I ever go to the Philippines in future? I won't say that I will be craving for it, but yes I would. 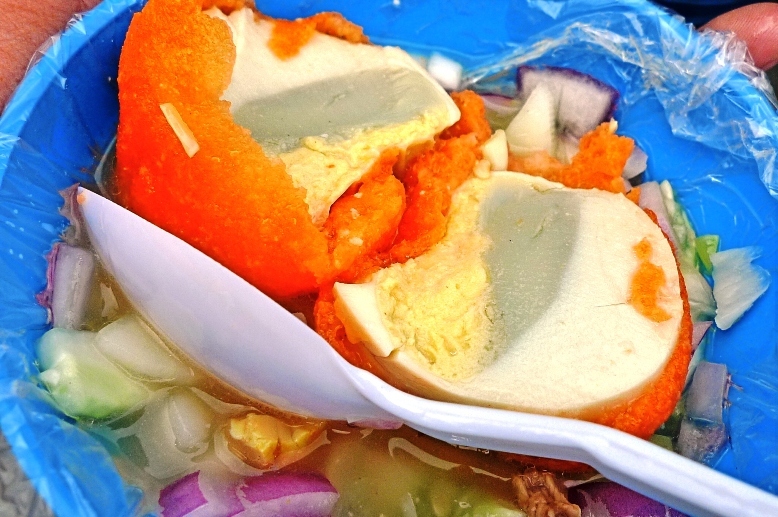 There is another version of kwek kwek called the tokneneng, which I did not try. 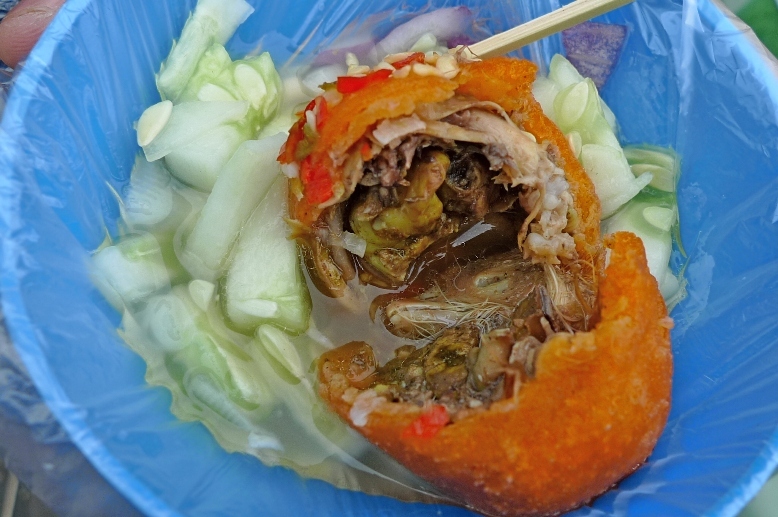 Tokneneng is the same as kwek kwek but it is quail egg instead of chicken or duck. 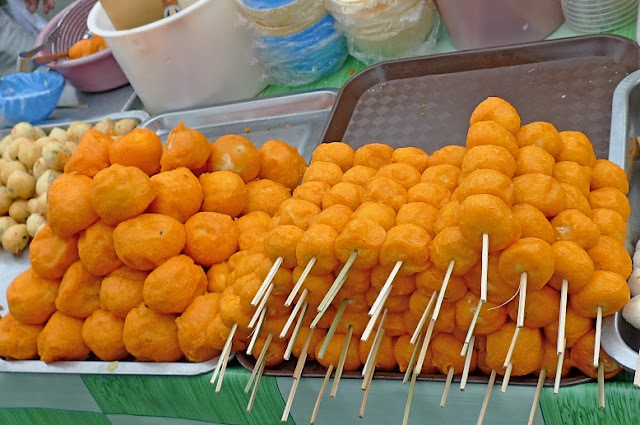 Now if you would like to know how to make your own kwek kwek, here is an instructional video just for you! Enjoy the video and notice the expression on one of the guys' faces when he saw what was inside the egg! LOL! Coming Up Next : Farewell To Rizal Park, Wham Burger And Manila!